The majority of the world's developed economies are growing at a sluggish pace, yet the price of NYMEX crude is trading around US$100 per barrel. Interestingly, the price of Brent Crude (the price most nations pay) is even higher! You may recall that during the last oil spike in 2008, world governments blamed those wily speculators. Therefore, in order to diminish speculation, the authorities banned leveraged 'long' oil exchange traded funds. It is notable that a few months ago, the price of NYMEX crude (once again) spiked to US$115 per barrel and this caused the politicians to panic. This time around, the governments could not blame the speculators so, a few days ago, they decided to dump 60 million barrels of crude on the market from their strategic petroleum reserves. This 'oil pour' created a lot of sensational headlines in the media and caused the price of crude to drop sharply. However, this decline proved to be short-lived and the oil price bounced right back up again. Political manipulation notwithstanding, the truth is that the fundamentals for petroleum are wildly bullish and all the governments put together will not succeed in suppressing the price of oil. According to the International Energy Agency, the world is likely to consume 89.3 million barrels of liquid fuels per day in 2011 (Figure 1) and in May, global production came in at 87.68 million barrels per day. Thus, you can see that output is failing to keep up with rising worldwide consumption and the 60 million barrels 'oil pour' represents less than a single day's usage! Bearing in mind the fact that global usage of liquid fuels will only increase in the future, one does not need to be a rocket scientist to figure out that the world will need to raise its production. So, in this editorial, we will evaluate whether the oil producing nations will be able to rise to the challenge. When reviewing crude's supply picture, it is important to realise that several oil producing regions are already past their peak flow rates and have entered an irreversible decline. For instance, it is no secret that the North Sea, Mexico, Indonesia and a host of other areas are past their prime. 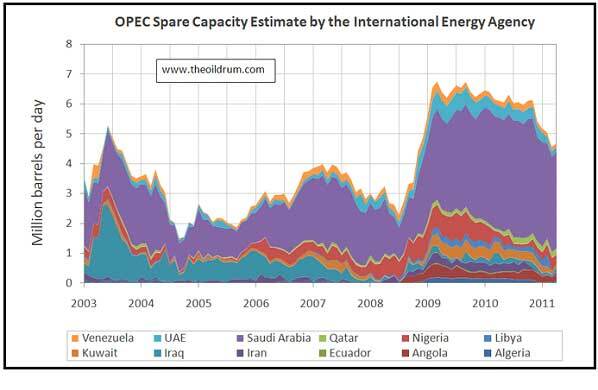 In terms of future production growth, all eyes are now fixated on OPEC which claims to have almost 5 million barrels per day of spare capacity. Nobody really knows whether OPEC is capable of increasing production by such a large amount but Saudi Arabia keeps insisting that it can ramp up daily output by approximately 3.5 million barrels (Figure 2). Figure 2: Saudi Arabia holds the key! Now, given the fact that the vast majority of Saudi Arabia's super-giant oil fields are extremely old, one has to wonder whether the nation is capable of boosting production. According to some reports, Saudi Arabia is struggling to maintain its current flow rates and in a desperate attempt to maintain reservoir pressure, it is pumping huge amounts of water into its ageing oil fields. More importantly, we are of the view that Saudi Arabia has grossly overstated its oil reserves and it is extremely unlikely that the nation has 270 billion barrels of petroleum. After all, the Saudi reserves have never been audited and a recent report by WikiLeaks suggests that the Saudis have inflated their oil bounty by 40%! The proof of the pudding is in the eating and when one reviews Saudi oil production data, it becomes clear that despite all the rhetoric, its flow rate is in decline! Figure 3 shows that Saudi oil production reached a high in 2004 and ever since, it has been heading south. Figure 3: Why is Saudi oil production declining? If Saudi Arabia is indeed sitting on humungous oil reserves and it has the ability to raise output, why has production failed to climb above the level recorded seven years ago? 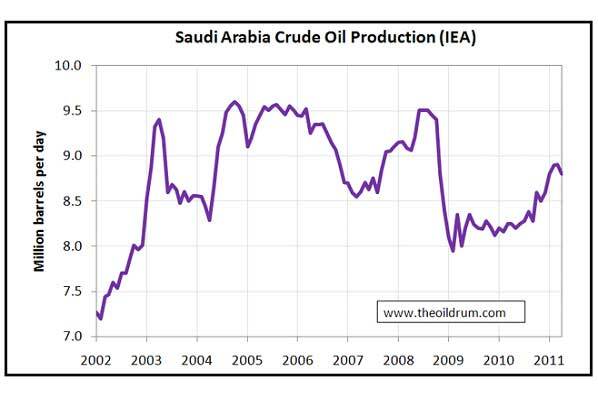 Now some may argue that the Saudis are deliberately keeping a lid on production, but we have a different view. Call us sceptics, but we believe that Saudi Arabia is already stretched to the limit and will find it hard to increase production. Unfortunately, if Saudi Arabian oil production is close to its peak, then the world simply cannot produce more crude. Furthermore, when you take into account the ongoing depletion in the world's existing oil fields, it becomes clear that the world is heading into an epic energy crunch. Under these circumstances, we believe that the price of oil will appreciate considerably and the impending surge will cause the next worldwide recession. However, as long as the global economy is expanding, the oil bull will charge ahead and it is likely that the all-time high recorded in 2008 will be left in the dust. Accordingly, we are maintaining our overweight investment position in upstream energy companies, oil services firms and nuclear energy plays. Although we are aware that nuclear energy is currently out of favour and many are unsure about its future, we are convinced that there is no Plan B. With the finite supply of liquid fuels, the world will need to generate more electricity and nuclear energy is the only viable option. Sceptics may want to note that if France can generate over 75% of its power from nuclear energy and do so without any accidents, then the rest of the world can surely do the same. It is notable that with the exception of Germany, most other nations are going ahead with their nuclear programs and this is good news for the sector. In summary, we view the panic fueled sell off in the nuclear sector as a great opportunity for the patient investor.